If you have read this far, you either practise Qigong already or feel drawn towards it. Getting started is simply a question of finding a teacher and a style that suits you. Sometimes what’s nearest and most convenient is the best place to start. Certainly it is the path of ease. A Qigong way of starting would be to put out a clear intention to the universe that you are looking. You can make this a little more concrete by asking around, checking noticeboards and other common sense things. When you get leads to this or that class pay attention to the subtle responses in your body. How does your energy respond? What are your very first gut responses to hearing about a particular class or teacher? Remember these as you move further along the road and check it out for yourself. When you try out a class be honest with yourself about your responses to the teacher. Are they someone you feel inclined to trust and respect? Do they manifest in their own being the qualities they are teaching? Take a look at the people who are in the class. Do you like what you see? It’s important that you have a basic feeling of warmth and trust towards your teacher and that they seem to you to be a good model. They don’t have to be Qigong masters, simply people who are sincere. Then you need to decide whether the style is right for you. Ask yourself what you want to achieve: to become less stressed, more fit, more profound, better at combat, to heal yourself from some ailment? If it’s combat skills you want then a sitting meditation class probably isn’t the best route. If it’s self-healing try to find a style that focuses on self-healing. Having said that, you may simply have to accept what is most easily available. Although the various styles have different intentions, all Qigong styles will have some benefit on overall health, will reduce stress levels and bring you into a deeper relationship with yourself. 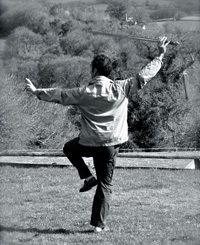 From a Qigong point of view, the teacher arrives when the student is ready. Simply start somewhere and follow your instincts. Bon voyage.